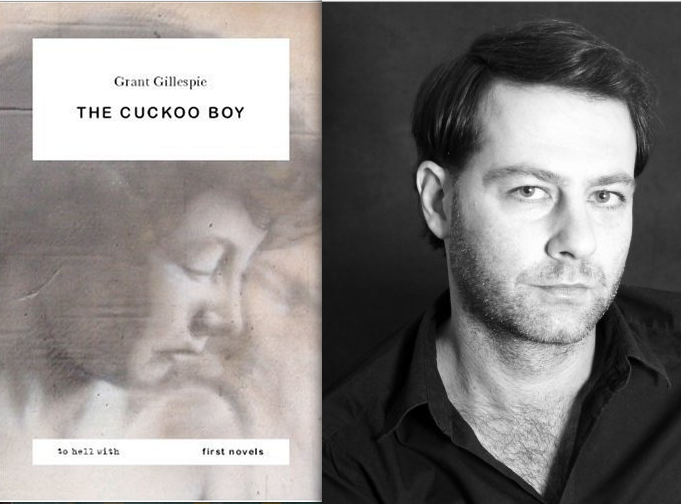 The Cuckoo Boy by Grant Gillespie is published by To Hell with Publishing, who I sorta work for (which I briefly talked about here). It’s a little tricky to really discuss the book when I feel like it’s… not my baby, but like I’m the au pair who appeared on the scene and just tried not to screw the kid up. By the by, this book is all about just that. How a parent’s misconceptions and foibles can be hilarious in isolation, but can turn disastrous when they’re pressed upon the wrong kind of child. The whole thing is about mismatches and misunderstandings, and it filled me simultaneously with laughter and a deep knot of dread all the way through. That’s all I’m going to say about the book itself – now over to Grant, on Ayn Rand, thinking like a child, and trying not to be too clever (it’s tough). Alice in Wonderland. You can see why in the guest post I wrote for Booktrust. I think we’ve all identified with a fictional character – which one have you secretly (or not so secretly) thought you resembled? I identified with – or rather I aspired to be identified as – Howard Roark in Ayn Rand’s novel The Fountainhead. This is embarrassing on two levels, firstly because the book is seen to be a vindication of everything right-wing and secondly because Roark is a strapping, heroic figure (which will never be said about me). As an actor I always knew that if I was asked to appear in the film version, I would be cast as the people-pleasing Peter Keating, rather than the fiercely uncompromising Roark. But it was Roark I admired. He is a man who would rather sink into obscurity, so long as he remained true to his integrity and vision. Well I have no doubts about who I’d like to praise, and that’s Evie Wyld. I first heard her read from her novel After the Fire a Still Small Voice at the To Hell With Christmas party, and I was absolutely transported. In fact I told her after her reading that when I grew up (in terms of talent, not age, I fancy she’s younger than me) I wanted to write just like her. Her novel is poetic (without a trace of pretension), poignant (without slipping once into sentimentality) and deeply compelling (whilst still being literary). It’s a beautiful story about generations of miscommunication. The main protagonists are all male too, and I take my hat off to her rendering of masculine inarticulacy. I can’t recommend it enough. She’s read my book now too and has been very complimentary so it’s a bit of a literary love-in. You started off participating in writing groups for fun, yes? Do you treat the writing process much differently now that you’ve gone pro? In truth I’ve obsessively written fiction since I was a very young thing and when I was 17 won a place on a writers retreat with the wonderful Helen Dunmore. I started with short stories, which grew longer and longer until I wrote my first novel whilst at university, (it’s in a drawer with my post university novel). Then, over a year ago now, a writer friend of mine Jon Digby, suggested meeting up with four other wordsmiths, (Soho Scribblers). Since then we’ve met once every couple of weeks in my Soho pad, when two of us share our latest chapters and the others give feedback. Though we all write in different styles and genres our responses are generally the same, and if five people tell you something is or isn’t working it’s easy to take their word for it. As a professional actor, there are often dry periods and so for me writing is a perfect second string. You can hole up and keep creative without the need for a director or a producer. But since I have two vocations, I’m not one of those people who have a routine. I wish I had the discipline to write every morning between 7 and 9, but I’m night owl by nature, so mornings are rarely seen and are never constructive. So I tend to be a sporadic, piece-meal writer. I might write pretty solidly for three days, then do nothing for another three, but I always come back to the page sooner or later. It’s a compulsion. What’s the worst thing you’ve ever written? Goodness, there’s so much. I often over-gild the lily when I write, plus I pepper my writing with lazy idioms (like gilding the lily). The bits I like the most are often the most awful. A dear friend of mine Lucy Briers read the first draft of The Cuckoo Boy and gave me tough love by saying things like:’You see this section here? Well I can see you sitting at you’re desk thinking, ‘Oh that’s terribly clever’. Well it’s not, it’s smug. You’re lifting me out of the narrative to admire the author! And this bit, I know you think it’s funny, but it’s not. Make it funnier or just cut it.’ I owe her a lot, and can still hear her on my shoulder when I get carried away with myself. 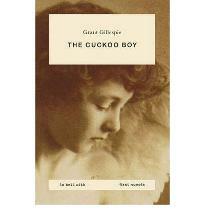 Much of The Cuckoo Boy is seen from a child’s point of view. How did you manage the task of thinking like a kid again? Being an actor means that you never really let go of that imaginative capacity to think like a child. In fact I played Moth in Loves Labours Lost and so studied the director’s son for that. Plus I’m a massive people watcher and as children are the most uninhibited, they’re also the most entertaining. The repressed mother, Sandra, is unintentionally hilarious, and one of the stand-outs of the whole book. Did you make a conscious decision to make humour a key element of the story? Yes, I think that if you’re dealing with something dark, a reader needs some relief. Otherwise you just feel like you’re being hammered into the earth. Perhaps some people will think that my treatment of the mother is too harsh, but when I laugh at a character it generally means that I like them. Can you explain a bit more about the boy cherub image that eventually led to the book’s cover? I have this Victorian photograph of a boy with angel wings bound to his torso and I’ve always been fascinated by the image. It captured that Victorian obsession with childhood innocence, but then the wings – which were so clearly tied to him – implied that these Victorian ideas were simply imposed on children by adults. I took the picture to Laurence and Lucy at To Hell and they loved it but they thought that to use the original image was not quite To Hell. When they showed me the mock-up I had to agree that they were right. It looked like a classic. It was the sort of book you’d see and think ‘Oh that’s probably from the turn of the century, I wonder why I haven’t heard of it.’ That would never do for a modern debut novel. So they commissioned this amazing artist, Part2ism, to spray paint the image on cardboard instead, so now it refers to the original, but has a modern feeling too. The unavoidable Writer’s Pet question: The Cuckoo Boy also features a cast of animals (including an evil white dog and two mysterious black cats). Pets? I had a beautiful black cross collie dog, when I was little, but she was ‘too big for the house’ and was sent ‘to live on a farm’. Naturally the realisation what that meant has given me nightmares in later life. Then my parents bought a West Highland Terrior (as in the book). It loved my mother and hated me, so after a few years of trying to win her over, I hated her right back. 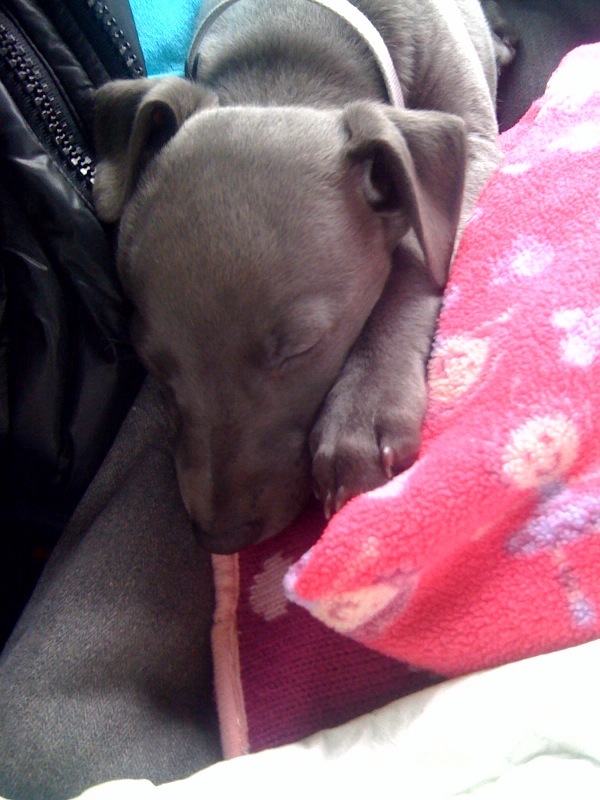 I now puppy sit a beautiful whippet called Vita. That’s much more my kind of hound. Obligatory writing space photo please! I am fortunate enough to have – in Ms Woolf’s words – a room of one’s own. I’ve always dreamt I would and now I have. 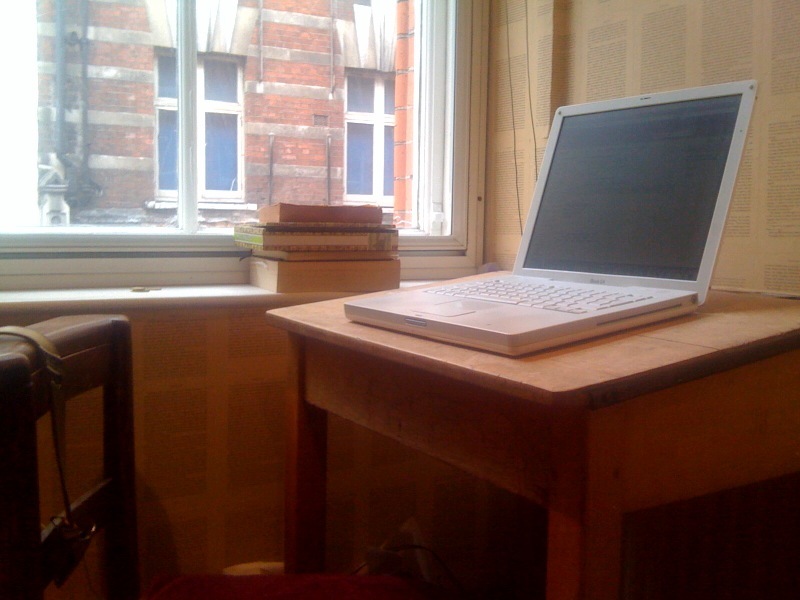 My desk is one of those old wooden school desks with a lid and an ink well. I have used blackboard paint on one wall so that I can write out my story arc and add notes and pictures plus I have papered the walls with pages from The Waves (also Virginia). It’s my absolute haven.